Hakkasan Las Vegas Nightclub is a best Vegas nightclub in the MGM Grand Hotel that opened on April 2013 that underwent a complete remodel and redesign of the old Studio 54. The venue is 80,000 square feet, with a 7,000 person capacity, contains 5 levels, 100 VIP tables, and is estimated to cost approximately $120 million. Hakkasan LTD joined forces in association with Angel Management Group known as AMG, Audiotek, 4 Wall Las Vegas, Sun City Electric, and The Morse Group to develop what has been now been ranked as one of the top 10 clubs in the world that would receive honorable mention placing 3rd in the 2014, and #2 in 2015 generating revenue between $100 and $103 Million on the Top 100 Nightclubs and Bar list. Hakkasan Las Vegas Nightclub is a best Vegas nightclub in 2016 that employs approximately 500 employees. The sound, talent, and aesthetics are of the highest level you can get in the industry. The remodeling included a new roof top that contains 1,200 tons of steel, a webbed ceiling, and approximately 3,500 cubic yards of concrete has been poured into the establishment. Level one and level two features the dining restaurant that serves Cantonese dishes by Chef Ho Chee Boon. The third floor contains Ling Ling Club and Lounge which is known for Hip Hop music. Level 4 of this venue features the Main Club and the adjacent Pavilion. Level 5 features the Balcony Mezzanine that is full of VIP suites that overlook the dance floor and dj booth. The moment you enter the club it hits all your senses at once with starting with the smell of jasmine incense drifting from the restaurant into the different levels of the club. When is Hakkasan Las Vegas Nightclub open? Operational hours in this best Vegas nightclub are Thursday, Friday, and Sunday from 10:00PM to 4:00AM, and on Saturday from 9:00PM to 4:00AM. 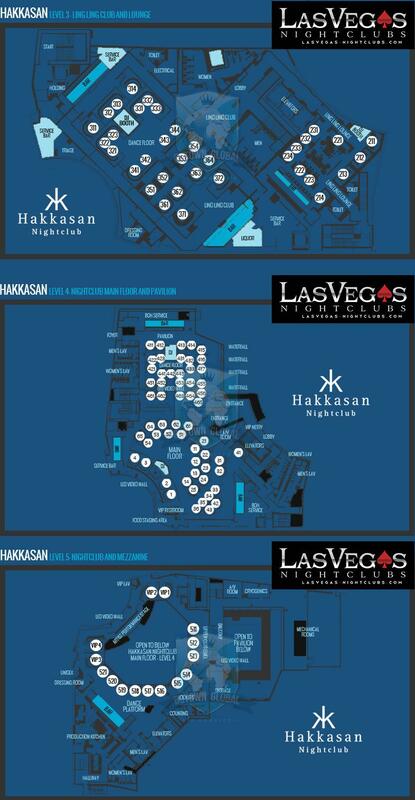 Where is Hakkasan Las Vegas Nightclub located? The location of this best Vegas nightclub is in the MGM Grand Hotel in the back of the property. Its best to get dropped off at Tropicana Avenue and Las Vegas Boulevard neat the New York New York walk way entrance to the MGM Grand. If you are in the Casino, keep an eye out for the signs that will point you in the right direction. What is the dress code at Hakkasan Las Vegas Nightclub? 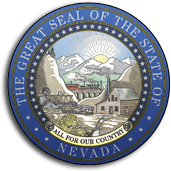 Dress code in this best Vegas nightclub is enforced and is very strict when you arrive at the door. The club will turn down guests that are dressed in sportswear, baggy clothing, ripped jeans, wife beaters, and hats. We advise that you should wear dress shoes, or stylish boots. Ladies should avoid flip flops at all cost. You should dress to impress so your group does not have a conflict with the door men. How much is the cover charge at Hakkasan Las Vegas Nightclub? This best Vegas nightclub has a $30 to $50 cover charge for general admission per person. During holidays and special events with pricier djs, you can expect the price for the coverage to get as high as be $60 to $100 like during EDC week and New Year’s. How long do I have to wait in line at Hakkasan Las Vegas Nightclub? Ling waiting times at this best Vegas nightclub is 1 to 2 hours depending on the night of the week. You should arrive around 9:30PM to beat the line crowd that develops quickly by 10PM. On Fridays and Saturdays, be prepared to wait in line for at least 1 to 2 hours, and on Thursdays and Sundays the entry process tends to run a little smoother depending on the dj line up that evening, but the lines are at least 1 hour. Generally there are 4 lines including general admission, guest list, presale tickets, and bottle service, The bottle service line is top priority to the club, so you will get in the fastest if you have secured reservation ahead of time. Why type of music do they play at Hakkasan Las Vegas Nightclub? Music genres at this best Vegas Nightclub are EDM and Hip Hop. EDM such as Trance, House, Techno, and Dubstep are featured in the Main room, Pavillion, and Mezzanine Level Balcony. Hip Hop music is played in the Ling Ling Club & Lounge. Who are the resident DJs at Hakkasan Las Vegas Nightclub? Resident DJs at this best Vegas nightclub for 2016 includes Above & Beyond, Axwell, Ingrosso, Borgeous, Calvin Harris, Dada Life, Dimitri Vegas & Like Mike, DJ Ruckus, DVBBS, Dzeko & Torres, Fergie DJ, GTA, Hardwell, Ingrosso, Jeff Retro, Lil Jon, Mark Eteson, Showtek, Steve Aoki, Tiësto, Tigerlily, The Chainsmokers, and W&W. The past resident DJs in 2014 and 2015 include Danny Avila, Bingo Players, Botnek, Don Diablo, NERVO, R3hab, Eva Shaw, Michael Woods, Ryan Marciano, Sunnery James, Tchami, and Ummet Ozcan. 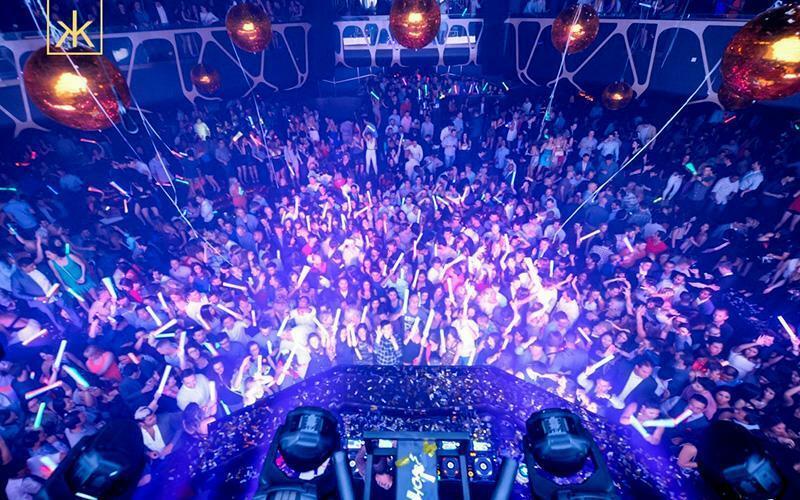 Who were the lighting, video, and audio designers of Hakkasan Las Vegas Nightclub? This best Vegas nightclub has a dream team of companies that consist of top experts in the industry. 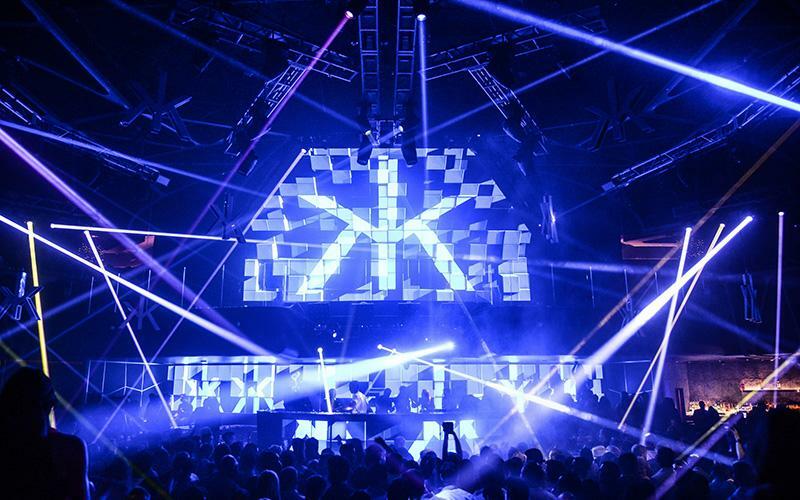 Hakkasan hired Frank Murray of Audiotek as their managing director, who brought in the lighting, audio, and video. Designer Andy Taylor represented Audiotek and AMG, and collaborated with Compute Aided Designs. Absen LED furnished the video walls. 4Wall supplied the entertainment lighting, rigging systems, and offered electrical contractor assistance for the fixtures. Greg See and Michael Callahan programmed the LEDs by incorporating Madrix software. AMG brought in Audio Video Lighting Innovations to be in charge of the wiring, and troubleshooting. R2W Inc was in charge of sound system assistance, and both Sun City Electric and The Morse Group were hired as the electrical contractors during this project. What is the Ling Ling Club & Lounge in Hakkasan Las Vegas Nightclub? Ling Ling Club & Lounge in this best Vegas nightclub is introduced on the 3rd level after having dinner on the first or second level of the restaurant. This part of the venue creates the perfect contemporary atmosphere to enjoy a round of drinks with your friends before entering the main club. The Ling Ling Club & Lounge features 10,000 square feet of space with marble paneling, custom Hakkasan lattice work, and a mix of sensual blue hues. There are 24 private seating areas, open seating, and 11 vip booths, 2 bars, and an elevated customized dj booth. The Ling Ling Club & Lounge at Hakkasan Las Vegas Nightclub is voted one the best Vegas nightclubs for hip hop music, top 40, and has featured past performances by Dj’s Melo-D, Cassidy, Turbulence, Irie, Crooked, Rev Run, Alex Lauterstein, Questlove, Dash, Phoreyz, and Ruckus. Occasionaly some of the main room DJs will perform in the Ling Lounge from time to time. What type of lighting does the Ling Ling Club & Lounge have in Hakkasan Las Vegas Nightclub? This best Vegas nightclub has an amazing lightning design in the Ling Ling club & Lounge that includes 34 Robe Robin 100 LED Beams for speed, special effects, and quick programing. They have also installed Robe Robin 300 LED Washes with multichip LED’s, flexibility, and smooth color mixing. There are 12 Robe Robin Pointes that have a 13 color wheel, 14 static gobo wheel settings, and 9 rotating gobo wheel settings. The lighting rig includes 6 Robe Robin DLX Spots for brighter color output, versatile zoom, and strobe effects, and there also 7 Solaris Flare RGB LED strobes for large-scale color-changing, and strobe effects. To intensify the blue hues, the Ling Ling Club & Lounge has installed 3 Altman Black Light UV-705s for high intensity illumination of fluorescent materials. Last but not least, the Ling Ling Club & Lounge lighting rig is operated by a ChamSys MagicQ Maxi Wing control board. What is the Main Floor in Hakkasan Las Vegas Nightclub? This best Vegas nightclub features the “main floor” or “main club” that offers an incredible nightlife experience without question. The Main Floor is 35,000 square with 31 VIP tables with 26 facing the elevated dj booth, and 5 behind it. The dj booth is the focal point of the room that features a suspended platform for performers. There are curved floor-to-ceiling 6mm Video Screens behind the dj booth with 2560 x 240 resolution, along with 5.2mm video screens that have 960 x 192 resolution. What type of lighting design does the Main Floor have in Hakkasan Las Vegas Nightclub? This best Vegas nightclub has a lighting design on the Main Floor includes 16 Robe Robin 300E Beams with multichip LED’s, flexibility, and smooth color mixing. There are 16 Martin MAC 350 Entour profile fixtures that offer a pure white LED source, split color effects, and enhanced color spectrums. The main floor rig includes 16 Clay Paky Sharpy moving bean lights that offer incredible output, 14 colors, and 17 gobos. There are also 20 ETC Source Four LED Lustr+ fixtures to maximize mixing capability, adjust white lighting, and for smooth transition of colors. Lastly, 14 Elation Flex LED Tape WPs were used for outlining and accentuation. 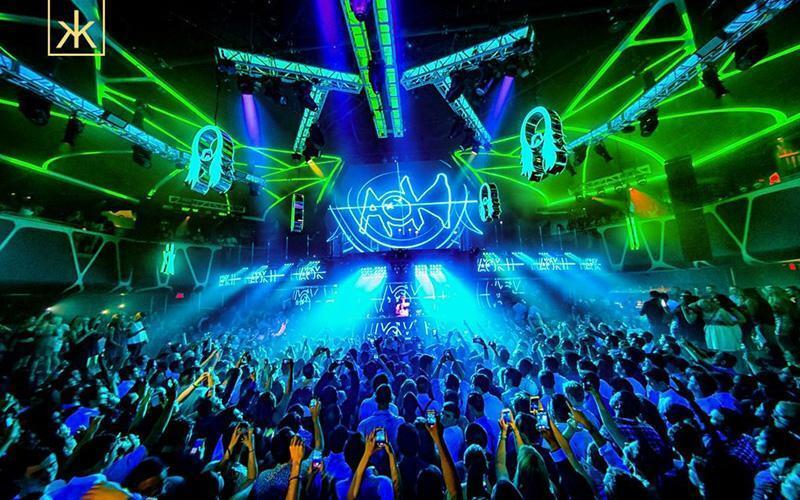 Other theatrical lighting and features on main Floor of Hakkasan Las Vegas Nightclub that define it as one of the best Vegas nightclubs includes a Tomcat 12” x 12” truss designed in the shape of the Hakkasan “K” logo that was created by 4Wall Las Vegas. The Hakkasan logo truss has Elation Flex LED Tape WPs on the lining, and is controlled by Elation ELAR-Driver-1 PRO that features DMX and Stand Alone operation modes. There are Showtec 5×5 Matrix blinders with built-in macros, 25 DMX channel mode, and fast-lock locking system. 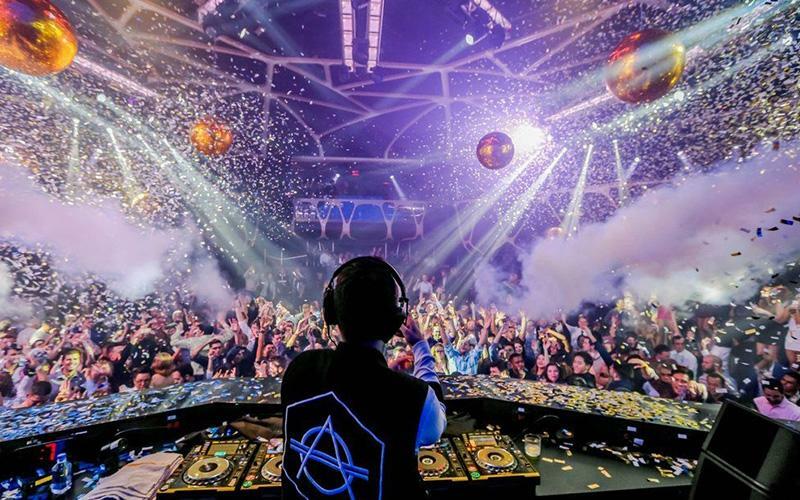 The Main Floor of Hakkasan Las Vegas Nightclub has some of the best Vegas nightclub lighting you will find equipped with Martin Magnum 2000 fog machines, which are the most specified fog machines that exist. Salvin Design confetti cannons shoot close to 100 pounds of confetti a week, along with CO2 units. Lastly there are RTI Nano 4 RYGB lasers that create a high-end laser light system. The entire lighting on the Main Club is operated by ChamSys MagicQ MQ 300 Pro console that features 64 Universes, 58 Full Playbacks, and 9000 fixture personalities. What is the Pavilion in Hakkasan Las Vegas Nightclub? The Pavillion in this best Vegas nightclub is located on the fourth level, which is adjacent to the Main Club dance room, and offers a Chinoiserie design with an amphitheater-style setting creating a semi-outdoor environment that features an oriental garden. There are four 2-story waterfalls on the parameters one of the main wall that are divided by between 2sections of green foliage. The Pavilion has 27 VIP tables, a Garden Bar, DJ booth, retractable wall, and a 6mm LED video wall screen with 1664 by 192 resolution. What type of lighting does the Pavilion have in Hakkasan Las Vegas Nightclub? The Pavilion in this best Vegas nightclub has a lighting design that is nothing short of excellence. There are 12 Robe Robin 300E Beams with a 9 channel rotating, and 9 channel fixed gobo wheels, and 7 color channel wheel. There are 4 Martin MAC 350 Entour profile fixtures for a pure white LED source, split color effects, and enhanced color spectrums. The Pavilion has also installed 8 Clay Paky Sharpy moving bean lights that deliver incredible output, with 14 colors, and 17 gobos. There are 8 ETC Source Four Lustr+ fixtures to maximize mixing capability, 8 Elation ELAR Quad Panels for perfect rich color blending, and 8 Elation ELAR Quad Bars for with dimming, and strobe effects. 38 Elation Flex LED Tape WP were used for lining. The Pavilion is controlled by its own ChamSys MagicQ console, but can also be controlled by the Main Floors ChamSys MagicQ console. What is the Mezzanine in Hakkasan Las Vegas Nightclub? The Mezzanine Balcony in this best Vegas nightclub is located on the 5th floor is the that features 15 VIP tables that are oversized that include semi-private rooms and VIP booths that wrap around in a semi-circle. The VIP booths offer a complete 180 degree birds eye view of the main dance floor where the DJ booth is positioned as the central focal point. The VIP booths are perfect for larger groups and include customized screens, and sound control capabilities. What type of lighting does the Mezzanine have in Hakkasan Las Vegas Nightclub? The Mezzanine in this best Vegas nightclub features a lighting design that provides an incredible experience for live energy. There are 6mm video screens that are 1408 by 896 resolution, and the lighting system includes 9 Robe Robin 300 LED Washes with 19 multichip LEDs with, 18 Robe Robin 100 LED Beams for quick speed, special effects, and fast programming. There are also 8 ETC Source Four Lustr+ units with shutter barrels for superior mixing capabilities, and a flexible range of color. The Mezzanine Level lighting rig is also controlled by ChamSys MagicQ 300 Pro console in the main room. What is the Webbed Ceiling in Hakkasan Las Vegas Nightclub? A webbed ceiling in this best Vegas nightclub is found in the Main Club. Audio Video Lighting Innovations installed more than 25,000 LED’s by incorporating Elation Flex LED Pixel Tape. The webbed LED ceiling is assembled by different sections that consist of 30-by-20 trapezoids. The webbed LED ceiling has 19 Enttec Datagate Mk2’s for DMX management. Learn about the Hakkasan guestlist. Hakkasan is located inside the MGM Grand.